My Countdown application for the Windows Phone 7 is now available in de Windows Phone Marketplace. I used my Countdown for Silverlight 4 control to create this app and added an Digital clock style. I'm planning to add more features like Live Tiles and extra clock types soon. I hope you like it. You can download it using the following button. 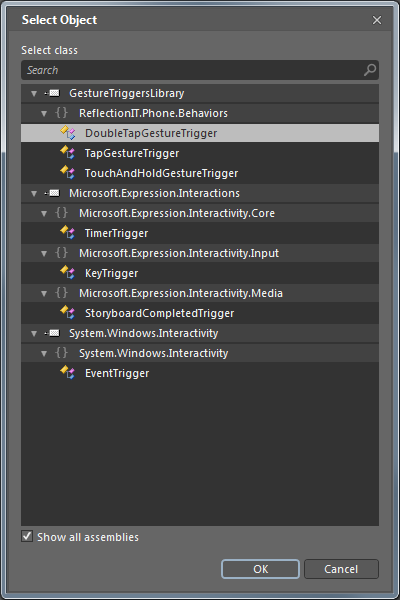 The Windows Phone tools in Visual Studio an Expression Blend let you create a 'Windows Phone Data Bound Application" (Template). This application uses SampleData and two List/Detail pages. The List (MainPage) contains a listbox which is templated. The ItemSource of this listbox is databound to the Items in the SampleData. When run the application and select an Item in the ListBox the DetailsPage is shown using navigation. This navigation is initiated from the SelectionChanged event of the listbox in the MainPage. When you remove this event from the XAML you would expect that the selected item in the listbox would be shown using the Accent color of your phone. But this doesn't happen. It took me a while to figure out the reason why, and how to solve it. The Selected (Visual)State of a ListBoxItem sets the foreground of the ContainerControl to the PhoneAccentBrush resource. The Two TextBlockes in the ItemTemplete of my listbox have a Style Property. Both styles are base on the PhoneTextBlockBase which has a Foreground property set to the PhoneForegroundBrush resource. This conflicts with the foreground set in the VisualState and therefore the color never changes. 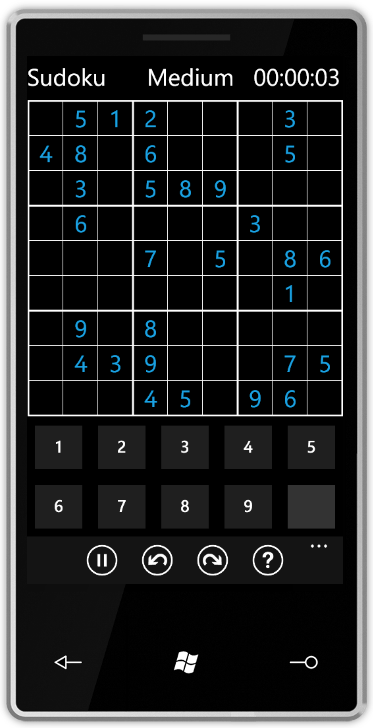 My Sudoku has been accepted in the Windows Phone 7 Marketplace. 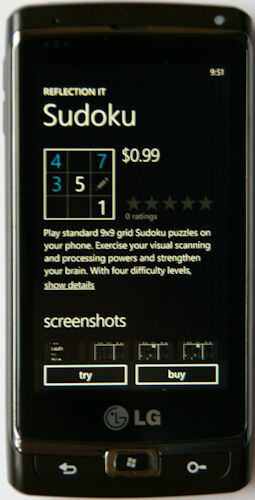 Play standard 9x9 grid Sudoku puzzles on your phone. Exercise your visual scanning and processing powers and strengthen your brain. With four difficulty levels, intuitive interface, and all the functions right at your fingertips, this Sudoku app is sure to be your favorite. 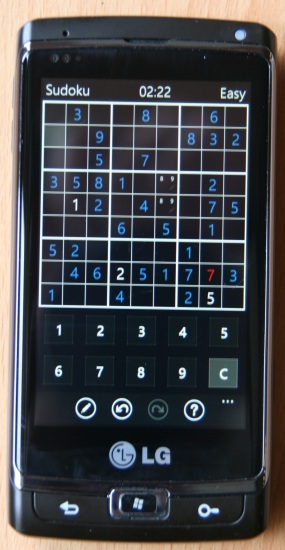 My Sudoku is running on a Samsung Windows Phone 7 device! Last year I wrote a Sudoku using Silverlight 2. I'm now porting it to the Windows Phone 7. I started designing the UX. I decided to stick to the Metro design. It's really clean. I'm using the ApplicationBar and Menu. I'm not totally sure which buttons to use. For now: pause, undo, redo and hint. I will have to create a ShakeTrigger which I will use to create a new game. I will have to postpone this until I have a real device to develop on. The accelerometer is hard to emulate. 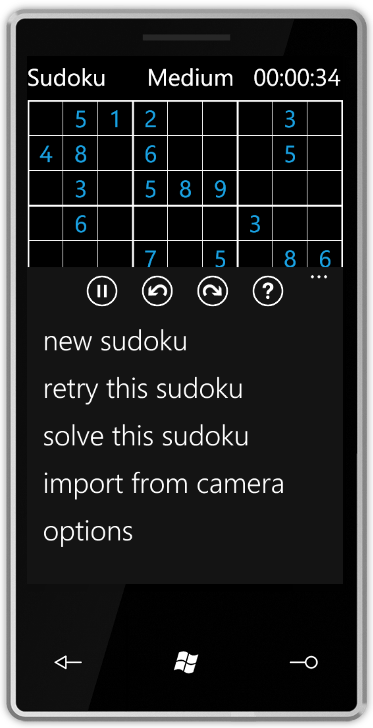 I'm also planning to 'import' Sudoku's using the phone camera and OCR. But probably not in the first version. The Windows Phone 7 supports single and multi touch gestures. I have implemented the Tap, Double Tap and the Touch&Hold gestures using Triggers. You can use them to trigger an Action in Expression Blend. You first have to reference the GestureTriggersLibrary. Then you add an Action to a control using the Behavior assets. Finally you change the TriggerType using the New button. The following example has tree TextBlock controls on with a ChangePropertyAction attached to it. 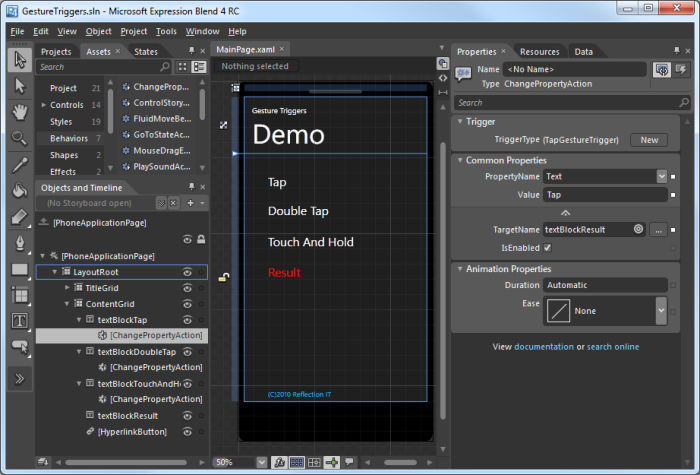 This action sets the Text of the red TextBlock (textBlockResult) using the Tap, Double Tap or Touch and Hold GestureTriggers.